Well, it was another long offseason for baseball fans, but it’s finally over. Opening day is finally upon us, even if the Mariners and A’s technically played two games last week. Unfortunately, some notable free agents remain unsigned, but the offseason and spring training are both over, and it’s finally time to look at each team’s World Series odds now that they’ve settled on their opening-day roster. Even with Luis Severino missing the early part of the season, the Yankees improved their rotation this winter with James Paxton and JA Happ. Meanwhile, their bullpen and lineup are just as dangerous as they were a year ago. Barring a disaster, the Yankees are a safe bet to win over 100 games and enter the postseason with all the pieces needed to win a World Series. The jury is still out on Houston’s rotation beyond Justin Verlander and Gerrit Cole. But their lineup is still lethal when everyone is healthy and the bullpen should be trustworthy. The group that won the World Series in 2017 is still largely intact, and that makes the Astros a serious threat in 2019. 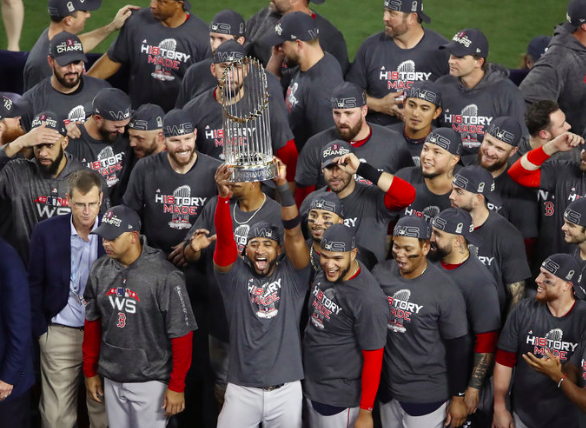 On paper, the Red Sox are just as good as they were last year. Boston’s lineup is filled with genuine stars, and so is the rotation. However, the lack of a bonafide closer could be a hindrance when the rubber meets the road. The Red Sox need to find answers there or hope they have enough to overcome a lacklsuter bullpen like the Astros did two years ago. Even after trading away some notable players this winter, there’s no roster in the National League with as much talent and depth as the Los Angeles roster. Until further notice, the Dodgers are the favorites to reach the World Series from the National League. Having an easier path to get there actually makes them a safer bet than the American League teams that are better than them on paper. If their rotation stays healthy, the Indians should have no problem dominating the AL Central yet again and reaching the postseason. After that, there will be some questions about their bullpen and some of the unproven players in their lineup. However, the Indians are a good bet to be playing in October and they have a rotation that is good enough to carry them in the postseason. Trading for Paul Goldschmidt may turn out to be the most impactful move any team made this winter. The rest of the lineup should be in good shape around Goldschmidt. However, there is some uncertainty in the bullpen, as well as the rotation with Carlos Martinez starting the season on the DL. If the St. Louis pitching staff can answer some questions, the Cardinals can be contenders. The lack of love for the Cubs is a little puzzling. It’s largely the same group of position players that won it all back in 2016. Also, both the Chicago rotation and bullpen are as deep as any in the National League. Talent-wise, they may be the closest in the National League to matching the Dodgers, making them a solid bet at 12-1. If healthy, a rotation of Max Scherzer, Stephen Strasburg, and Patrick Corbin would be frightening for any team to face in a 7-game series. However, they still need to score runs. Youngsters Juan Soto and Victor Robles need to help fill the void left by Bryce Harper. The same is true for veterans Ryan Zimmerman and Anthony Rendon. If those guys have good years, the Nationals are bonafide contenders. It’s not just that the Phillies signed Harper, but they also added J.T. Realmuto, Jean Segura, and David Robertson. The back-half of the rotation needs to be better, and the jury is still out on some of their young relievers, giving the Phils questions to answers. But the Philadelphia lineup is going to mash, and that could be enough to carry them to October. The Brewers are another team being undervalued by oddsmakers. The lineup is scary, and their bullpen was one of the best in baseball last year. Milwaukee’s biggest questions are still in their rotation. But a potent offense and dominant bullpen were enough to overcome that last year all the way to Game 7 of the NLCS, so the Brewers can’t be counted out in 2019.